Eagle Rock, a large eagle-shaped rock, sits high on the Sacred Land of the Winnemem Wintu Tribe, making sure the river below is safe. It looks much the same as it did centuries ago, except it has been desecrated by gunshots. This sacred space is one of the first sites to be mapped as a part of the Winnemem Wintu Sacred Sites Documentation Project. 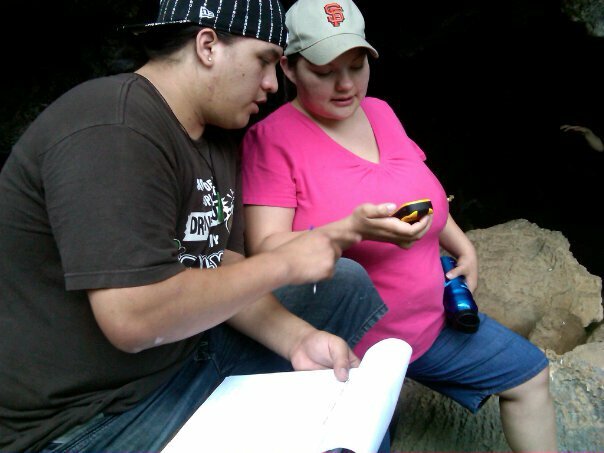 DataCenter partnered with Pacific Institute to provide GPS training for youth and elder tribal members so they could map the sites themselves. 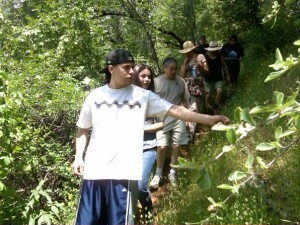 Throughout the summer, youth and elders of the tribe will be hiking across their land, stopping at sacred sites to tell stories and, using GPS mapping technology, record the location of that site on a satellite map. The tribe will then use this map to protect their sacred lands from development. 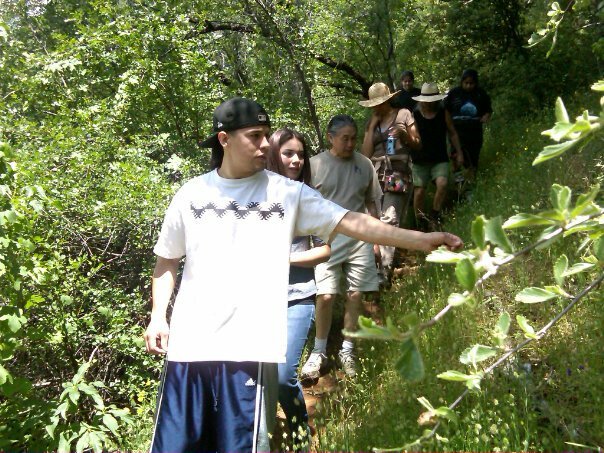 This project is the next step of the oral history project, beginning in 2008, in which Winnemem Wintu young adult Mike Preston collected and recorded stories from tribal members about each of the sacred sites. More background on the project (pdf). On June 15, the tribe embarked on the first of several trips to map their sacred sites. For Audrey Ward, a 26 year old member of the tribe, Samwell Cave was one of the most memorable sites of the day. A cave with a story: many years ago a young girl and her sister hid in this cave to hide from a neighboring tribe that was known to be abducting women. One of the girls died when she fell into a deep hole in the cave. Since she was a child, Audrey was told not to go there because it was a sacred space used by tribal medicine doctors. But at the age of 26, not only did Audrey get to map this sacred space in her memory, she also got to click a button and map the location’s significance for the whole world, especially land developers, to see. The Sacred Lands Film Project is filming these trips for an upcoming documentary. While some tribal members are intimidated by the idea of chronicling this process on film, Audrey said, “It’s good to have our people and stories on film, because if there is a time when someone from our tribe cannot tell the story, the film will have the story for many people to see.” In this way, the voices of the Winnmem Wintu people can be heard in communities throughout the United States and the world. Audrey and her tribe have over 40 more sites to mark on the map, and they’ll be taking trips throughout the summer. Thank you for your gifts which make this empowering project possible. We look forward to keeping you informed as the sacred site map is completed.